Swarming UAVs demonstrate enormous attack potential. But the technology still needs to be proven and trusted. As part of its roadmap for the future use of unmanned systems, the US Navy and Marine Corps is looking at deploying swarms of low-cost Unmanned Aerial Vehicles (UAVs). 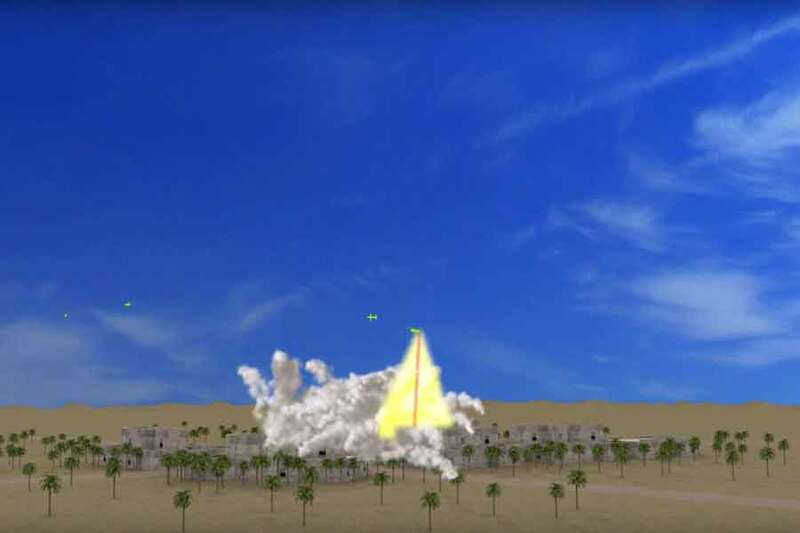 The Office of Naval Research has developed the Low-Cost UAV Swarming Technology (LOCUST) programme, which fires small UAVs from a tube-based launcher. UAV swarms seek to move away from debates around the utility of manned aircraft and larger UAVs, into the questions around Josef Stalin’s reported statement that: “Quantity has a quality all of its own.” Swarms are mini or micro UAVs (or larger depending on the payload) acting in groups of at least three to five, as defined by Professor Chris Baber, chair of Pervasive and Ubiquitous Computing at the University of Birmingham. This is distinct from a group of UAVs, which are larger, up to the size of loitering munitions, and hold a pre-defined patrol pattern awaiting an order from a human operator. In contrast, swarm UAVs operate in a more autonomous and adaptable manner. As the term ‘swarm’ implies, many of the mechanics, doctrines and roles involved in the utilisation of these types of UAV derive from the natural world. Baber describes the operation of a swarm as “akin to that of a large flock of birds or insects working under three core principles: direction, distance and separation.” This refers to the direction they travel (following a leading UAV), the distance to be maintained between members of the swarm and ensuring the separation of each UAV's payload sensor to cover a different area and avoid duplication of coverage (this balance is key to ensuring the swarm works). Baber argues that this new model builds on the current approach where a relatively small number of larger UAVs are being used remotely for effects such as reconnaissance and attack. Separately however, research is being conducted into how swarms can be utilised more broadly in offensive operations. This seeks to build on advances in loitering munitions, according to Steve Harmer a human factors specialist at BMT Defence Services. Loitering munitions, such as the UK Ministry of Defence’s Fire Shadow concept , whilst totally expendable, due to less advanced sensors, rely on external verification from a separate platform prior to human authorisation for a final attack. Harmer argues that swarm UAVs can overcome these drawbacks through autonomous operation, by delegating the observation of key areas to the swarm, which independently maintains its flight pattern and reports developments of interest as instructed by human users. This concept utilises UAVs that can be reused whilst being affordable enough to be totally expendable. Baber stresses that less complex manufacturing processes can be achieved by using cheaper and more readily available commercial-off-the-shelf components and computers available on the high street, thereby dramatically cutting the cost of swarm UAVs. This aids their key characteristic of operating in large numbers by also being seen as a disposable asset, provided that the swarm’s overall operational effectiveness is not compromised. This is a significant advantage when compared with larger systems, whose use must always be balanced against the risk of being lost in action, with the subsequent loss of operational capability as well as the substantial cost of replacement. This will become more significant as a lost swarm member could be replaced using 3D printing technology that enables its parts to be produced near the frontline and then assembled; a stepping stone to printing completed UAVs. As part of this growing trend, the US Office of Naval Research is pursuing the LOCUST programme to investigate swarming UAV technology for the US Navy and Marine Corps. The first tests were conducted on land in early 2015 where numerous UAVs (including the $15,000 tube-launched Coyote) were fired and synchronised in mid-air to create a swarm (though under human supervision). The Coyote was originally developed to be deployed from the P-3 Orion Maritime Patrol Aircraft to provide on-demand situational awareness. Harmer believes swarm UAVs will be used to complement existing assets, such as giving armoured vehicles additional reconnaissance capabilities, but will over time replace existing equipment, including swarms supplanting helicopters in the key role of screening shipping lanes and littoral environments ahead of ships. As tests at sea, with up to 30 Coyote UAVs are planned, LOCUST seeks to apply core swarm principles to the realm of naval warfare, where large numbers of ‘LOCUSTS’ could potentially substitute for a single, expensive, anti-ship missile when engaging a major surface ship. Not only is this seen as a cheaper way of gaining attack capabilities, there is also a school of thought to suggest it is more effective as well. This is because many defensive systems in the maritime environment, for example, the US Aegis, are configured for tracking and countering conventional weapons such as supersonic missiles that are only likely to be encountered in numbers far smaller than those of a swarm. In comparison, slower, but significantly more numerous swarm UAVs are harder for these sophisticated radars to detect and, as a result, for their accompanying defensive weapons to engage before it is too late. Yet, despite the advantages of this approach, swarm UAVs, like other weapons, are exposed to counter measures. Baber says these encompass a broad variety of vulnerabilities. First, by disrupting the swarm through interfering with the communications intended to make it fly as a combined entity. Second, by attacking the communications directing swarms to their targets. These two can be achieved with either electronic warfare jamming tactics or hacking (if the frequency is known). As a result, Harmer says that the potential users of swarm UAVs will have to consider whether the cost of proofing them against such countermeasures undermines the low-cost factor inherent in these systems, and whether higher end and more survivable assets should be sought. Baber’s third, more kinetic method, involves deploying chaff to disrupt the swarm. The fourth is based on a more primitive countermeasure. Similar to swarms derived from nature, a rudimentary equivalent of a spider’s web could be constructed whereby static traps such as laser activated net launchers, trap the swarms or a certain proportion of them. As swarms become more advanced and swarm members become smaller, the total quantity can be increased, thereby compensating for their low individual survivability. Countering them therefore, may have to be done by deploying an opposing swarm, that is better able to undermine the more sophisticated avoidance technology. Bearing in mind these obstacles, Baber points out that so far, most swarm UAV technology is only viable as part of a laboratory experiment or through limited physical trials in controlled conditions and will need to undergo further testing to become a viable military asset. Specifically, ways need to be found to allow swarms to operate independently of human operators and currently centralised computer control systems. Instead, distributed and autonomous computer processors within the swarm, enabling one UAV to delegate tasks and operating areas to the others, should be developed utilising both radar and laser sensors to ensure reliability. Additionally, this UAV Command and Control function would need to be capable of being handed over to another swarm UAV member should the leader become disabled. The US Air Force is seeking to counter this threat in innovative new ways. 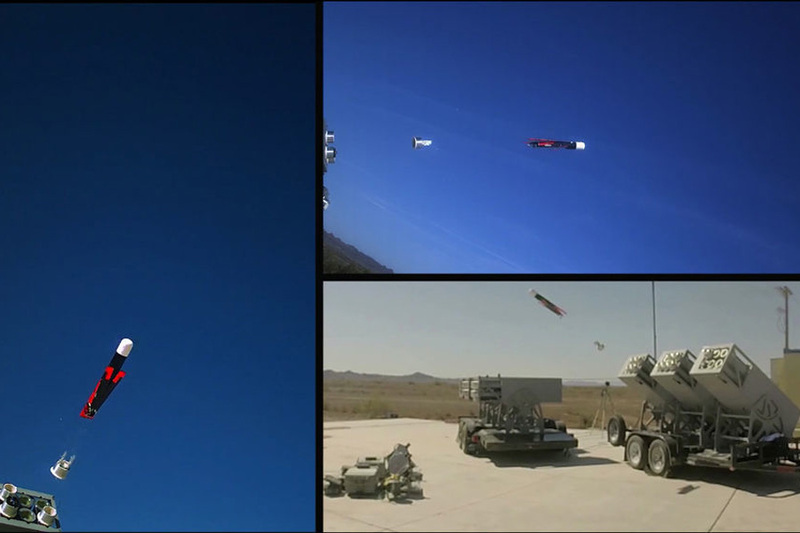 Run by the Pentagon’s Strategic Capabilities Office, Predix was tested for the first time in 2015 and sees up to 30 UAVs deployed simultaneously from a flare dispenser fitted to the the F16 Fighting Falcon. Though still in its early stages, this and similar systems could be used as and when the situation requires for roles such as reconnaissance. Although in their infancy, Baber stresses the value of swarm UAVs lies in covering large areas, whilst at the same time giving greater depth to combat forces, meaning different components of the swarm can leave and rejoin when required to provide coverage of different areas of the battlefield. Given the rapidly increasing cost of military hardware and the corresponding decrease in critical combat mass this entails, the factor of affordability has been noticed not only by the US military, but by other nations. Alongside the potential military utility offered by UAV swarms, the UK recognises the way innovative new thinking such as this can increase the effectiveness of armed forces whilst reducing costs. To make this point, the MoD has launched the “Many Drones Make Light Work” competition for SMEs to work with academia and primes towards the development of swarm UAVs with respect to: open, modular platforms; mission management; and sensing technology enablers. According to Baber, it is likely similar efforts are being undertaken in Russia and China, as well as Germany and the Netherlands. He also raises the need for NATO to develop common operating procedures and platforms for swarm UAVs, which currently, do not exist. Harmer also argues that the swarming concept has great potential not only in the air, but under the water for roles such as large area screening and clearing of underwater mines by Unmanned Underwater Vehicles. On a more strategic level, swarm UAVs could deter aggression by being positioned over and along national borders. Harmer even alludes to swarms being deployed from a manned aircraft to broaden coverage; creating challenges for airspace management. Although the concept and mechanics of operating a swarm have been proven, Harmer stresses that there must be a clear doctrine on how swarms are used operationally. Crucially, he stresses that in times of limited defence expenditure and reduced manpower, partially substituting the latter with autonomous swarm UAVs—despite their enormous potential—will take many years to prove in exercises and campaigns that this new technology can be fully trusted. Having achieved a BA Hons in International Relations with Political Science, Jack Richardson completed an MA in Air Power, History, Theory and Practice at the University of Birmingham in 2016. His interests include geopolitics and military history.